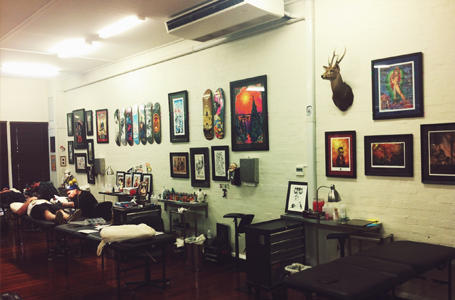 SEVENTH CIRCLE STUDIO IS A PRIVATE TATTOO STUDIO NEAR BRISBANE CITY WHICH PROVIDES HIGH-QUALITY CUSTOM TATTOOS AND FINE ARTWORK. Established by Brisbane mainstay Lawrence Hocking in 2009, the aim of Seventh Circle Studio is to deliver world-class tattoos and showcase the talents of some of the best tattooists in Brisbane. Seventh Circle Studio has grown from strength to strength. Starting as a small four-person operation in a tiny street shop, the studio now houses up to 10 artists in a large beautiful space in Woolloongabba’s heritage-listed “Moreton Rubber Building”. 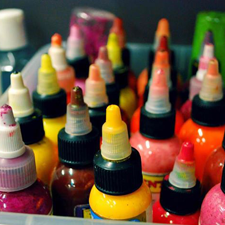 Our quiet and comfortable studio ensures that all tattoos are performed in a timely manner whilst conforming to the highest industry standards of hygiene and professionalism. Whether you’re seeking a large, detailed custom piece or just a little something, we’ve got you covered. No job is too big or too small. We cater to dedicated collectors as well as first-timers and our diverse crew of artists ensure that everyone ends up with nothing less than an amazing tattoo. We also offer cosmetic eyebrow tattoos to those seeking beauty services from a tattoo professional. At Seventh Circle Studio, we strive for the highest quality work, so in most instances your artist will request a proper sit-down consultation. 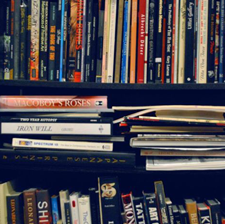 Consulting with your artist allows both parties to express their ideas and establish a solid design. For simpler designs, a consult isn’t always necessary, but feel free to ask for one should you have any questions. We are happy to give a rough quote upon finalising your design, however, we do not give out direct quotes via the web. If you would like an idea of pricing and availability, it is always best to phone or drop by the studio and discuss your tattoo concept in detail. 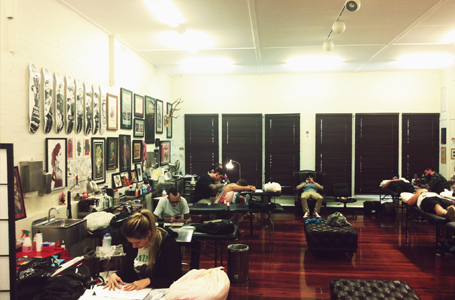 Seventh Circle’s tattoo shop is located on Brisbane’s southside near South Brisbane at Level 2, 815 Stanley St, Woolloongabba. The discreet studio entrance is directly opposite the Gabba Stadium (Gate 2) . Our opening hours are 11am – 6pm Tuesday – Saturday. We are a private studio and predominately operate on an appointment-only basis. This ensures a comfortable environment for our clients and allows us to make the highest quality tattoos free from distraction. Don’t like waiting? Just want something small? Seventh Circle Studio also takes walk-ins whenever possible, so please call the studio to check availability. For a faster turnaround, please call us or visit the studio.